As the automotive industry is growing at rocket speed, tyre industry too, the abundant investment is a testimony of thereof. 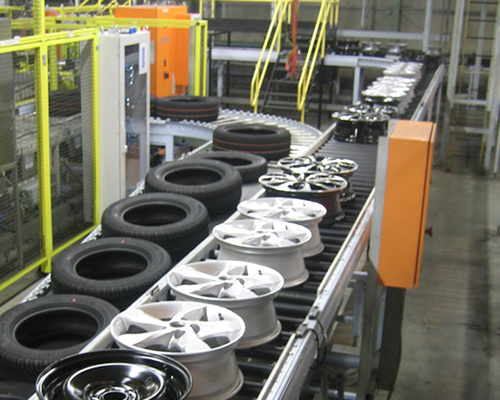 These tyre industries are constantly adopting the most advanced technology for the better and higher outputs, among the automation system is one in which they have invested significantly. To make this automation system sturdier, reliable and safer, best in class quality conveyor belt is obligatory and this is what we provide to the tyre industries to make their tyre manufacturing candidly easy job. Such a collection of our conveyor belt for tyre industries is composed of the prime quality PVC/PU material to advantage its best attributes, including excellent resistance against high impact, abrasion, cut, heat, corrosion, chemical, water and fire, whereas use of vulcanization technology upsurge its attributes to the farthest. The range is overwhelmed in the tyre industries for its second to none performance under the harshest environments and augment the productivity of the respective industry to the notable extent. This conveyor belt for tyre industry is engineered to the highest quality standards and is confirmed by ISO accreditation for meeting all the quality, safety and reliability regulations. Whether it is tire building, tire handling or tire cooling requirement, our conveyor belt assures to outperform and deliver the highest return on investment, interested one can privilege this conveyor belt in the variegated specification or customized specification as per their need, we can design & develop any type of conveyor belt at best prices.